It was a bar so nice, they named it twice. The team behind Dear Irving and Raines Law Room, Yves Jadot Restaurant Group, is opening the second outpost of the former in midtown. 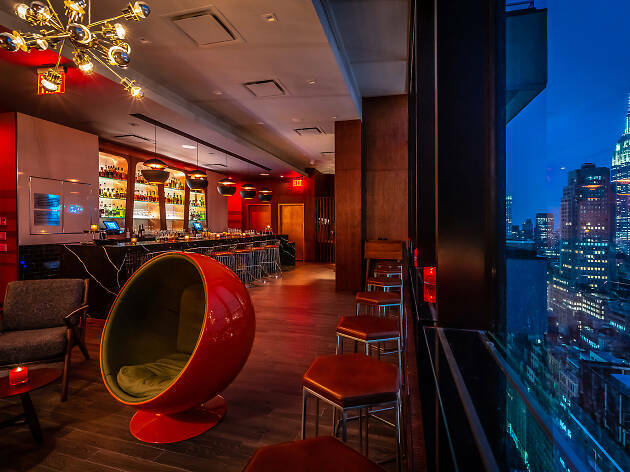 Dear Irving on Hudson is a bi-level cocktail bar that takes up the 40th and 41st floors of the newly opened Aliz Hotel in Times Square (310 W 40 St). While the bustling location is worlds away from the quiet block of Irving Place, the founders are sticking to some familiarities. Most noticeably, a "time travel" theme, with one floor akin to 1960s James Bond and another decked out in Art Deco finishes. The James Bond-style 40th floor is currently open and split into two sides: On the north end, guests enter through a wood closet inspired by Sean Connery’s agent. Inside, there's an oval-shaped ceiling, along with pink sofas, orchid wallpaper and sputnik chandeliers. Behind a wood panel screen is a living room area with a library, gold metal tables and blue velvet armchairs. On the south side, the bar is flanked by two more living rooms and a round fireplace. There are also large terraces on each side with suspended egg armchairs to look out at the city and plan how you're going to save the worl—er—nurse your hangover. 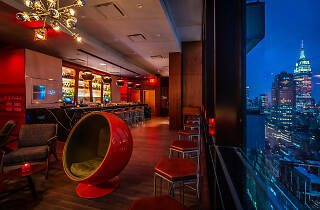 The 41st floor will open in March and be reservations-only. Similar to one section of the original Dear Irving, the Art Deco bar will use crystal beads as partitions and have 1920s velvet-covered furniture. The space also includes two large terraces for outdoor booze and views. Another commonality between the old and new Dear Irving is the cocktails. The bartenders are reprising some of their original cocktails for the downtown regulars. Some of these "Tried & True" drinks include the Wildest Redhead (scotch, lemon, honey, allspice dram and cherry brandy) and La Paloma (blanco tequila, agave, grapefruit, lime, seltzer and salt). Some brand-new, New York-inspired cocktails on the menu include Balto Old-Fashioned (bourbon, apple liqueur, maple and bitters), Vice Versa (gin, grapefruit liqueur, bitters, rosé cava and grapefruit) and Panorama Daiquiri (rum, pineapple gomme syrup, toasted coconut and lime). Dear Irving on Hudson, we want to visit you ASAP. Sincerely, Us.